...happens to be the most appropriate way to describe our latest event at the Carlton Woods. 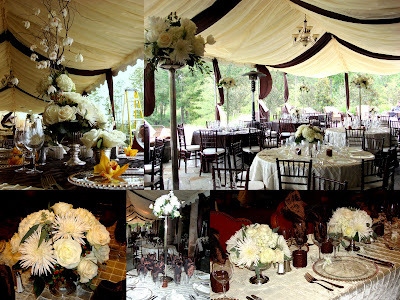 Using solid silver standards and bowls filled to capacity with the most luxurious white and ivory flowers, they filled the room with an overwhelming sense of royalty. 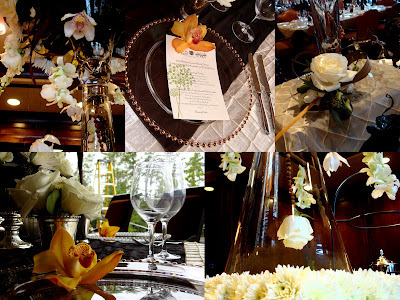 In addition to over 40 centerpieces we also created a beautiful table scape for the Champions table with 8 silver mint julep cups filled with roses, 2 low silver bowl centerpieces overflowing with a variety of white and ivory blooms, and a showstopping silver trumpet with chocolate and white cymbidium orchids dangling from curly willow. 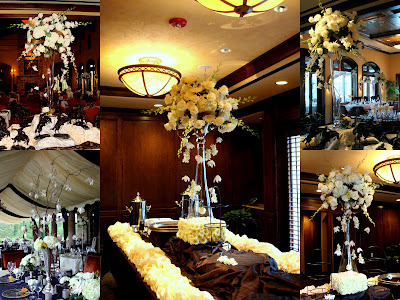 But we didn't stop there; we also created two showpieces for the buffet tables complete with dangling orchids, suspended roses, arching tulips, and a hint of chocolate with brown hypericum berries. After all was said an done, there are still no appropriate words to completely encompass the overall feeling of the event. Photos aid in the endeavour to portray the beauty of the arrangements but there is something about standing in a room bursting at the seams with gorgeous flowers that just can't be caught on film. Not to mention the fact that we always have a wonderful time!